BRIGHTON, Mich - REGISTER for the Brighton Chamber's Golf Classic at Lakelands Golf and Country Club by clicking here: http://bit.ly/1lldeTf or sign up to volunteer at the event here: http://bit.ly/1ohc7rq. 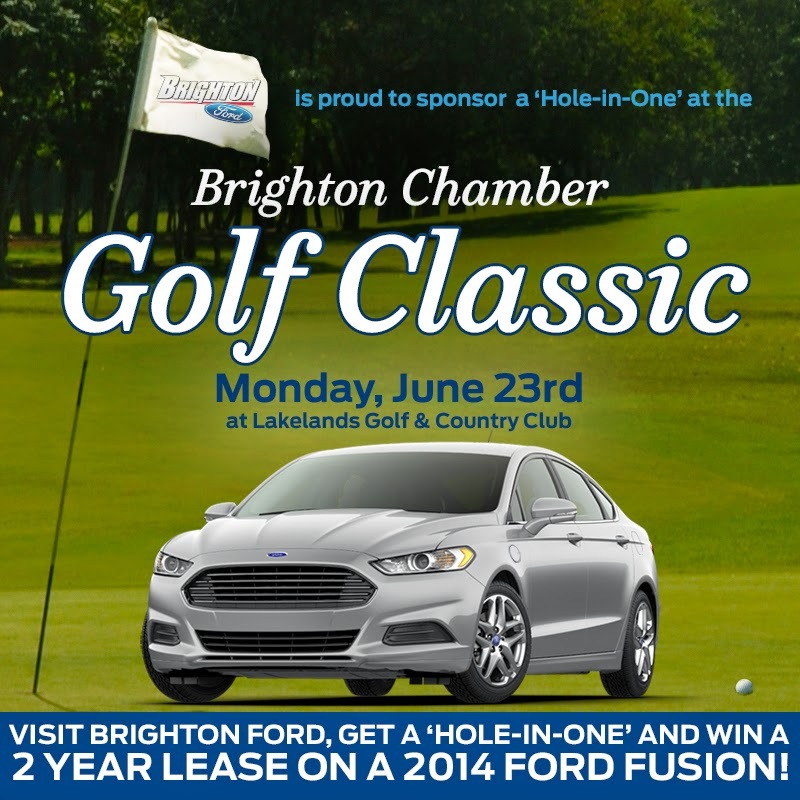 Join Brighton Ford in supporting the Greater Brighton Area Chamber of Commerce at the Chamber Golf Classic at Lakelands Golf & County Club on Monday, June 23rd! We are proud to be sponsoring a Hole-in-One and giving golfers the opportunity to WIN a 2 year lease on a 2014 Ford Fusion! Golfers are able to register for one, two, three or an entire foursome! Enjoy a day of golf, a gourmet breakfast and/or lunch, bag services, access to the club's elite driving range and complimentary beverages! There will be two shotgun starts at 8:00AM and 2:00PM. If you are not a golfer, you are welcome to join everyone for food, drinks and networking after the outing for $30! We are looking forward to a fun-filled day at Lakelands Golf & Country Club with the Greater Brighton Area Chamber of Commerce! We hope to see you there for your chance to get a hole-in-one and WIN a 2 year lease on a 2014 Ford Fusion! Don't forget, you can register for the golf outing here: http://bit.ly/1lldeTf or sign up to be a volunteer: http://bit.ly/1ohc7rq. The Summer Showcase at Brighton Ford is still happening! Stop by and see our incredible selection of top-quality, luxury vehicles, and we will have you riding like a royal in no time! Visit us today for a test-drive! Brighton Ford is located at 8240 Grand River Ave. just north of I-96 in Brighton. We are a family owned and operated business that strives for customer satisfaction. For more information on Brighton Ford visit BrightonFord.com or give us a call at (800) 836-8206.